The objective of this study was to evaluate the effects of natural zeolite on the performance and nitrogen metabolism of Rambouillet ewe lambs. Forty Rambouillet ewe lambs with an initial weight of 41.06 ± 3.9 kg were randomly assigned to one of four experimental diets, namely 0, 20, 40 and 60 g of natural zeolite (Comercializadora Omega® México) per kg dietary dry matter in a completely randomized design and sixteen ewe lambs were used in a 4 x 4 Latin square metabolism study. Performance was not modified by natural zeolite levels in the diet, and daily gain showed a quadratic response. Ammonia concentration at 8 and 12 hours increased linearly with zeolite. Zeolite increased ruminal pH linearly at 8 and 12 hours. Acetate and butyrate presented a quadratic response, and total ruminal volatile fatty acid concentration was linearly increased by zeolite. Nitrogen retention showed a linear and quadratic response to zeolite. The estimated fractions of protein digested in the small intestine, when rumen-fermentable energy was limiting (PDIE) and when rumen-fermentable nitrogen was limiting, showed a linear and quadratic response to zeolite. PDIE was positively correlated (r = 0.96) with average daily gain. Natural zeolites are aluminium silicates, which can capture ammonium ions (NH4+), reducing the rate of their release and absorption from the rumen. It has therefore been suggested that their inclusion in ruminant diets favourably affects the nutritional efficiency of ruminants by improving the efficiency of nitrogen (N) utilization by rumen microbes (Ruiz et al., 2007). This may be useful when dietary urea is rapidly hydrolysed to ammonia (NH3) in the rumen, a characteristic that may be partially responsible for the low efficiency of N capture in the rumen by ruminal bacteria (Sadeghi & Shawrang, 2006; Calsamiglia et al., 2010). Therefore, NH3 fed in excess can be detrimental to the production efficiency of ruminants (Bartley et al., 1981) and can contribute to environmental pollution (Broderick et al., 2009; Moshoeshoe et al., 2017). Even though it was reported that zeolites are capable of sequestering and, subsequently, releasing proportionately 0·15 of the NH4+ present in rumen contents (White & Ohlrogge, 1974), Sweeney et al. (1980) did not find an effect of synthetic zeolite on rumen ammonia (NH3+) concentration. Regarding the performance effects on beef and dairy cattle that consume zeolites, feed intake has been reported to be increased (McCollum & Galyean, 1983; Eroglu et al., 2017), but results have been inconsistent, possibly due to variations in the ratio of zeolite to urea or zeolite to rumen degradable protein in the diet. Sadeghi & Shawrang (2006) included 30 g/kg of zeolite in a diet that contained 20 g/kg of urea and observed a decreased ruminal ammonia N concentration, increased fibre digestibility, and improved performance in Holstein steers. Based on these considerations, the objective of this study was to evaluate the effects of adding three levels of natural zeolite to growing rations for ewe lambs, while maintaining the same level of urea, on productive performance, ruminal fermentation, N metabolism and live weight changes. This work was conducted in accordance with ethical standards and approved by the ethics and biosafety committee of the Universidad Autonoma de San Luis Potosí. The experiment was carried out in Soledad de Graciano Sanchez, San Luis Potosi, México, at a latitude 22°14´5.8", longitude 22°14´5.8", and altitude 1835 m.
Forty Rambouillet ewe lambs with initial weights of 41.06 ± 3.9 kg were randomly assigned to one of four experimental diets, which contained 0 g, 20 g, 40 g and 60 g of natural zeolite (Comercializadora Omega® México) per kg dietary dry matter (DM) (Table 1) and 15 g/kg of urea. The diet was offered as a total mixed ration, and ewe lambs were housed in individual pens equipped with feed and water bowls. Feed was provided at 08:00 and 15:00. Ewe lambs were adapted to their experimental diets for eight days and the study lasted 52 days. All ewe lambs had free access to feed to ensure 100 g of orts per kg of the amount fed daily and feed intake was recorded daily. The lambs were weighed at the beginning and the end of each period to estimate average daily gain (ADG) and feed conversion (FC) was expressed as the ratio of feed intake to ADG. The same four diets that were used in the growth trial were randomly assigned to 16 Rambouillet ewe lambs (1 year; 42.7 ± 2.9 kg), which were housed in individual metabolism pens in a naturally ventilated barn. Water and diets were offered at 8:00 and 17:00, and the lambs had free choice access to feed. There were four 15-day experimental periods, each with 10 days for adaptation and 5 days for sampling. Feed, faeces, urine and orts were collected during the collection period. Ruminal fluid was obtained in the last three days of each period (60 mL) via oesophageal tube before feeding, and 4, 8 and 12 hours post feeding. pH was measured immediately with a pH meter (Benchtop Cole Parmer 05669-20, Vernon Hills, IL, USA). Samples were acidified with 1 mL of sulphuric acid (30%) and then frozen at −20 °C until laboratory analysis. Ten millilitres rumen fluid was mixed with metaphosphoric acid (5 to 1 ratio) and centrifuged (40,000 × g × 10 min. The supernatant was used to measure the proportion of volatile fatty acids (VFA) by gas chromatography (Erwin et al., 1961). Ammonia N was measured using the indophenol method (McCullough, 1967). Feed samples were analysed according to AOAC (1990) for dry matter (DM) (method number 981.10), crude protein (CP) (method number 967.03), and neutral detergent fibre (NDF) and acid detergent fibre (ADF), according to Van Soest et al. (1991) with a heat-stable amylase included in the NDF, and expressed including residual ash. The Henderson-Hasselbalch equation and ruminal pH were used to estimate the amount of NH3 and NH4+in the rumen to evaluate whether zeolites affected NH4+ capture (Abdoun et al., 2007; Valpotić et al., 2017). PDIA = (CP) (1.11) (1- Deg) (dsi); PDIMN= (CP) (0.64) (Deg - 0.1); PDIME = 0.093 (MOF - EE); PDIN = PDIA + PDIMN; PDIE = PDIA + PDIME. Feed samples of each treatment were dried, weighed, and put in Ankom bags (0.35 g per bag) and prepared for the in vitro digestibility technique by Tilley & Terry (1963), as modified by Alexander & McGowan (1966). Samples were incubated for 48 hours with a mixture of 90 mL McDougall (1948) buffer solution and 10 mL rumen liquid obtained from the ewe lambs in each stage of the experiment. The results were analysed according to a completely randomized design using each ewe lamb as an experimental unit (Steel et al., 1997). Orthogonal polynomial contrasts were used to verify linear or quadratic effects for natural zeolite level on ewe lamb performance. The metabolism results were analysed according to a replicated, 4 × 4 Latin square design (Steel et al., 1997). Variables measured more than once were analysed using the repeated measures procedure. The correlations between PDIE, PDIN and productive performance (average daily gain, feed intake and feed conversion) were estimated. Data were analysed with JMP7 software (Sall et al., 2012). A P-value of 0.05 was selected as the significance level. 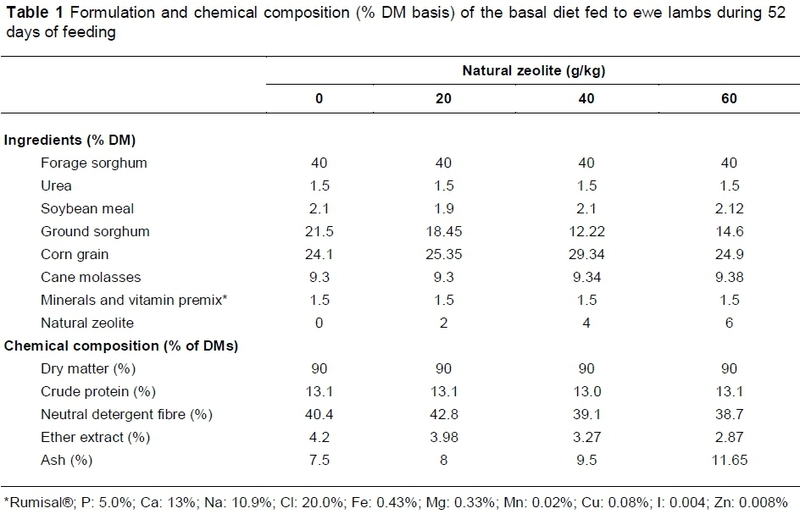 Dry matter intake and feed conversion were not modified by the level of natural zeolite in the diet (Table 2), while daily gain showed a quadratic response (P <0.05) (Table 2). The addition of zeolite increased the NH3 concentration at 8 and 12 hours (linear P <0.05) (Table 3). Zeolite also increased ruminal pH (linear effect (P <0.05) (Table 3) at 8 and 12 hours. Acetate and butyrate presented a quadratic response (P <0.01), and total VFA concentration was linearly increased (P <0.01) in ruminal liquid as a result of the addition of zeolite (Table 3). Nitrogen retention showed a linear and quadratic response (P <0.05, Table 4) to increasing level of natural zeolite, and the PDIE and PDIN estimated fractions showed a linear and quadratic response (P <0.05). The PDIE was positively correlated (r = 0.96) (P ≥0.03) with average daily gain, while PDIN with NH3 (r = 0.95; P = 0.04) and intake were positively related to retained N (r = 0.97; P = 0.02). The use of natural zeolite had no effect on DM intake (Table 2) as observed in previous studies using natural and synthetic zeolite (Sherwood et al., 2006; Cole et al., 2007; Dschaak et al., 2010). Johnson et al. (1988) reported that lactating dairy cows decreased feed intake when synthetic zeolite was added at 20 g/kg, which is a low dose if it is expressed as a proportion of DM or metabolic weight. Natural zeolites with urea showed a quadratic response in ADG, with the maximum gain with 40 g/kg. Pond (1984) reported that only when clinoptilolite was added at 20 g/kg dietary DM did it promote growth of lambs. In that experiment a positive response was observed with 40 g/kg DM. However, even when this was associated with a decrease in ruminal NH3 concentration (Sadeghi & Shawrang, 2006), results from this experiment did not show any beneficial effect on NH3 or NH4+ concentrations. The unique benefit of zeolites in rumen fermentation can be associated with a higher pH, which stimulates fibrolytic bacteria, which is reflected in the acetate concentration (Pan et al., 2003). The higher pH could be related to the high NH3 concentration. When urea is administered, the pH can increase rapidly in the rumen (Abdoun et al., 2007). This contrasts with other hypotheses regarding the mechanisms of action of zeolites. Deligiannis et al. (2005) used a natural zeolite in growing lambs that were infected with gastrointestinal nematodes and found that natural zeolite reduced the establishment of the nematodes and resulted in differences in ADG and DM intake. Since the ewe lambs were dewormed in this study, this may be an explanation for the increased digestibility. However, Grabherr et al. (2009) added zeolite at 0, 10 and 20 g/kg DM in cows and observed that supplementation led to a significantly reduced ruminal DM and organic matter digestibility, which was also reported by other authors (Johnson et al., 1988; Cole et al., 2005; Dschaak et al., 2010; Stojkovic et al., 2012). Rumen NH3 and NH4+ concentrations in the first hours were not affected by the addition of natural zeolite, but after 8 and 12 hours the concentrations of both increased. This contrasts with the results from Kardaya et al. (2012), who reported that lambs fed diets without urea, zeolite or urea-impregnated zeolite rations produced similar ruminal NH3 concentrations, and those from Montalvo et al. (2005), who reported that zeolite could reduce the concentration of free NH3 in the supernatant of the anaerobic digestion process of synthetic and piggery wastes, which may be different in the anaerobic conditions in the rumen. 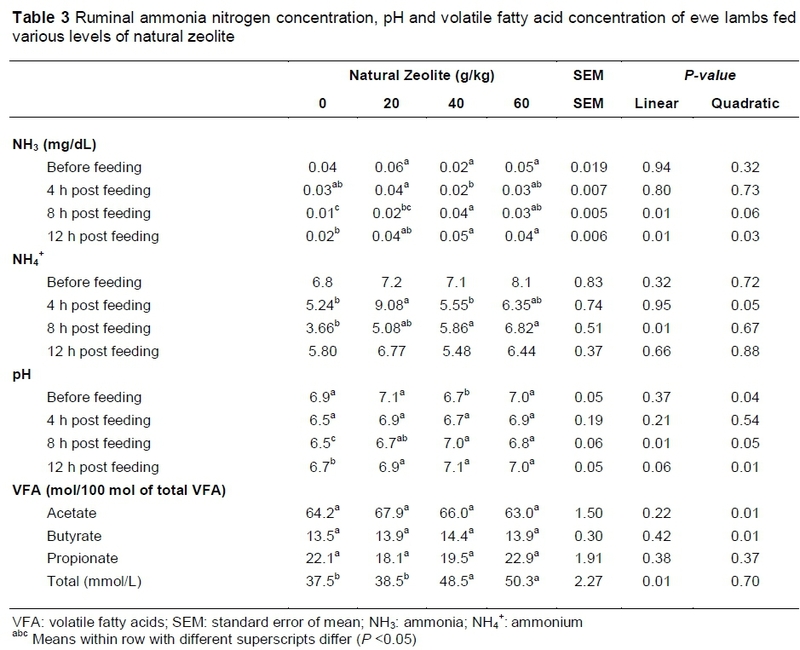 Sadeghi & Shawrang (2006) reported low levels of ruminal NH3 concentration in steers that received 20 g/kg of urea and 0 g/kg of natural zeolite at 0, 2.5, and 5.5 hours post feeding, unlike the steers that received 30 g/kg of natural zeolite and 20 g/kg of urea, and the concentration of ruminal NH3concentration was higher. Stephenson & Huff (1992) reported that natural zeolites could function as NH3 reserves in the rumen and could increase dietary N utilization. Through infrared spectroscopy, Michael et al. (1991) showed that naturally occurring zeolite can absorb urea under aerobic conditions from aqueous or ethanolic solutions. However, that does not mean it can function in the same way in the rumen. All ruminal pH values in the present study were in the normal range of 6.5 to 7, where most of the ammonia would be present in the form of NH4+, as reported by Abdoun et al. (2007). Higher ruminal pH values as a result of zeolite treatment could be due to high ruminal NH3 as a result of rapid urea hydrolysis in the rumen. The rise in ruminal pH as a result of the increase in ruminal NH3-N was also demonstrated by Pan et al. (2003). However, this was in contrast with Kardaya et al. (2012), who found that the addition of zeolite decreased ruminal pH, which indicated that zeolite was able to capture NH3 through its cation exchange capacity. The total VFA concentration tended to increase (P = 0.01) when the ewe lambs were fed zeolite, whereas molar proportions of acetate and butyrate responded quadratically to increasing levels of zeolite. Higher acetate concentrations in lambs fed urea rations were associated with its higher NH3 concentration and its higher pH value. This finding is fairly in agreement with Pan et al. (2003), who revealed that increases in ruminal NH3-N might increase ruminal pH and total VFAs and stimulate cellulolytic bacteria activity in the rumen. Dschaak et al. (2010) observed that the inclusion of zeolite in the diet of lactating dairy cows decreased total VFA concentration. However, Bosi et al. (2002) observed that the inclusion of zeolite in the diet of lactating dairy cows had no effect on the concentration and molar proportion of VFA. The concentration of NH3-N in the rumen is an indicator of the rate of ruminal N degradation, the concentration of rumen-degraded N above microbial needs, and the amount of dietary energy available for the ruminal microorganisms (Li et al., 2011). Increased consumption of NDF can decrease ruminal NH3 concentrations (Royes et al., 2001) for greater microbial protein synthesis and concurrent higher demand for rumen degradable protein. Lizarazo et al. (2014) reported that when sheep were fed a diet in which the use of coated urea did not affect the urinary and faecal N excretion or the retained N, there were changes in the efficiency utilization of the N body among treatments. In contrast, the authors found that treatments of urea + zeolite decreased faecal N and increased N retention. Furthermore, N can be recycled by ruminants to compensate for differences in the release time of N in the rumen (Reynolds & Kristensen, 2008; Toprak et al., 2016). It is now well established that N retention depends on the intake of N and the amount of fermentable carbohydrate in the diet (Sarwar et al., 2003). However, Sherwood et al. (2006) found that N mass balance was not affected by the addition of zeolite clay in steers fed with 12 g zeolite per kg. Research with other species has shown zeolite clay to be effective in adsorbing N, therefore having the ability to reduce N volatilization losses. The lack of a response to zeolite in the current study could be due to variations in the clays and the methodology for assessing N losses. Additionally, zeolite clay may not have the cation exchange potential needed for the conditions in open pens as opposed to confinement (Sherwood et al., 2006). The PDIE value was also higher for zeolite treatments. 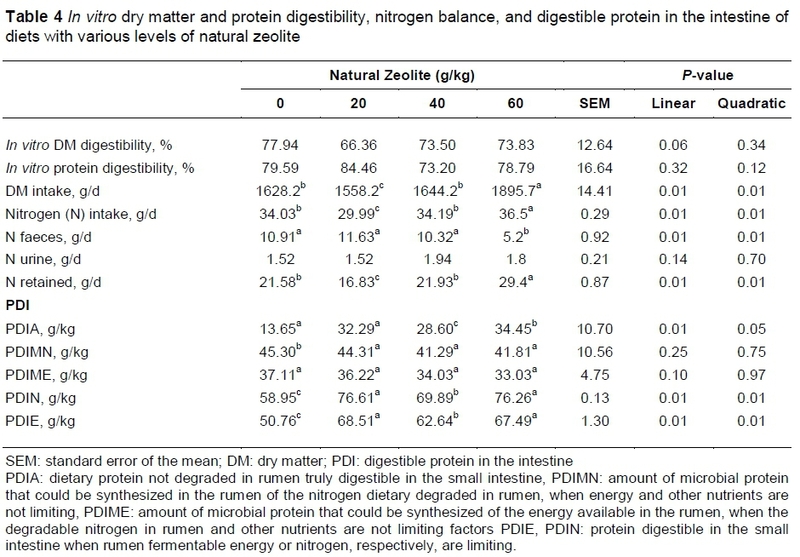 Tabulated PDI values of the diets calculated from in vitro data have to be increased by the addition of zeolite. Thus, the nutrients available for the protein synthesis of rumen micro-organisms probably led to similar levels of amino acids to the intestines (Giger-Reverdina et al., 2015), whereas in this study, PDIN was greater than the PDIE, indicating that dietary rumen degradable N was suitable, which could explain the high correlation (r = 0.96; P =0.03) between PDIE and daily live weight gain. The inclusion of 20 to 40 g/kg zeolite in the diet had a positive effect on the average daily gain, ruminal fermentation patterns and PDIE estimated, and nitrogen retention increased with the inclusion of 60 g/kg, but more research is necessary to determine the mechanisms of action in the rumen. Authors thank financial support to FAI-UASLP C18-FAI-05-34.34. The authors acknowledge Comercializadora Omega® (San Luis Potosi, Mexico) for providing the natural zeolite. The authors' responsibilities were as follows HALR: conceptualized the study; JARJ and JACJ: conducted the animal experiment, collected the biological samples, and performed the analyses; JARJ and HALR: performed the analyses; JMPR, GDM, and RRR: contributed reagents and helped to interpret the data; AV, JARJ, and HALR: prepared the manuscript; JARJ, JMPR, GDM and HALR: contributed to the interpretation of the data; and all authors: read and approved the final manuscript. Ramos, J.A., Mendoza, M.G., Arand, I.E. García, B.C. & Bárcena, G.R., 1995. Caracterización del nitrógeno del pasto estrella con dos sistemas: proteína metabolizable y proteína cruda digestible. Rev. Fac. Agron. Luz. 12 (2), 209-220 (Eng. Abstr. [ Links ]).